When a Will is not enough! If someone has gone to the trouble of making a Will it’s fair to assume that it is because they want some certainty that their loved ones will receive the benefit of inheriting their assets. In some cases a Will is enough to deal with simple distribution of assets on death, for the majority of people their circumstances are too complex for a Will to cope. Society has become more fragmented and family structures much more complicated over the past 40 years. We are now faced with many situations and circumstances that the generation before didn’t have to deal with. Having a chat with a Barrister Intermediary to discuss your concerns/wishes will not cost you a penny, but could save you thousands of pounds. Get in touch to book your free, no obligation, fact-find discussion. How sure are you that your Will is Valid? There are a number of matters that affect the validity of a Will, but why is this so important? Validity of the Will is the first thing that must be established on death. If the Will is not valid then the person will have died intestate, leading to additional costs and potential legal disputes (see previous post). Why might the Will not be valid? These issues are important, particularly if the Will was subsequently challenged, especially from someone who has been excluded from benefiting under the Will. NB: With a divorce the appointment of, and gift to, the former spouse both fail but the Will itself is not revoked. How can a Will be drawn up and by whom? There are a number of ways of making a Will. Individuals will need to consider all the options and potential pitfalls before deciding on the best option for them. The Legal Services Guild recognise the need for individuals to have access to a Will writing service which is completed by fully qualified, experienced, insured and regulated professionals who are able to offer advice regarding all available options and are able to draft and deliver those documents in a timely manner at a reasonable cost. If you are going to the trouble of making a Will then you need to be confident that it is going to stand up when needed ie THAT IT IS VALID! Well, who would have thought it? I’m celebrating my first year in business today. Can’t quite believe where the time has gone, the knowledge I’ve gained and the things I’ve achieved in the last 18 months. Couldn’t have said it better myself Jo! I’ve always been of the opinion that you never say ‘No!’ to an opportunity – you just never know where it might lead. Because of that philosophy I have recently diversified my business, as a lot of you will know, and now offer legal services – both directly to my own clients, but also working in collaboration with providers of other professional services eg solicitors, IFAs and accountants. It has opened up a whole new area of business and that’s what continues to make life exciting and enriching. In terms of saying ‘Thank You’ the biggest ones must go to my immediate family and friends because without their encouragement and help in the early stages I would never have got to the point of being a ‘start up’. So, to Barry, Jonathan and Nic holas a huge thank you. To Claire – thank you so much for putting up with me when we were going through the tortuous process of coming up with a name and strap line, although I think the wine helped! To the very talented Michael Quinlyn-Nixon, who has since gone on to set up his own business (Quinlyn Nixon Art), thank you for your advice and expertise on the logo design, colours etc. You were absolutely right – taking the time at that stage is so important as it defines your brand moving forward. Carrie Dennison – I couldn’t have set up the website/blog without your help, which gave me confidence that I really was capable and would even be able to maintain the site myself!! With the exception of one or two blips you were right!! Without the support of Gillian Khachikian at Derwentside Enterprise Agency I wouldn’t have had a clue where to start in terms of setting up the business. She gave me encouragement, but most importantly the skills to move forward – from writing my business plan, to developing marketing skills, to knowing how to deal with my accounts and HMRC. Thank you Gillian. Most importantly during the last 18 months I have had the good fortune of meeting a host of new contacts, many of whom have become good business and personal friends. One of the first business contacts I made was ‘Mrs Consett’, aka Fran Williams, owner of Perspective Business Centre. We instantly hit it off and have worked collaboratively many times over the last year. Fran is brilliant at connecting and introducing business people and it is through her support that I have gained clients and joined some excellent networking groups. opportunity for me to make friends and also do business – not to mention the Spot Chat with cake!! When I first started thinking about setting up as a Virtual Assistant, even though I had done lots of market research, I had no idea there was such a huge virtual world out there. 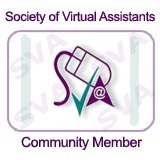 I have met some very talented VAs who provide exceptional support for a wide range of organisations. Some specialise in specific types of task but many of them have such a fantastic array of skills to offer employers. You really are the Creme de la creme – you know who you are!! I can’t end this post without mentioning two great networking groups – Medomsley Networking Group and Derwentside Business Network – that have been of great support to me during the last year. There is quite a bit of crossover, with some members being in both groups, but what a great bunch of people. These groups have provided business support, friendship and a new social avenue. Last, but by no means least, I have to thank the clients who have put business my way. Your confidence and faith in my ability means so much to me. I am grateful for your support in allowing me to be part of your business and I hope that faith has not been misplaced. I look forward to continuing to work with you in the years to come. As you are reading this I will be having a few days away in the Lake District – pure coincidence. We should have taken the trip a few weeks ago but had to reschedule. However, I will be returning in the evening to celebrate at a Gourmet Evening at Newcastle Falcons. Again pure coincidence, but what great timing. If you ever get the chance to go it is a fantastic evening. Now we’re getting into technical legal rules but bear with me – they’re very important. Full intestacy – This means that a person has died without having disposed effectively of any of their property by a (valid) Will – giving rise to total intestacy. This could be because they made no Will, the Will was invalid for any number of reasons, the Will was revoked (eg by marriage) or the Will fails to dispose of any asset/property. Partial intestacy – This means there is a valid Will but it does not dispose of all of the estate. This situation may arise where the Will contains no residuary gift* or where there is a gift of residue* but this has failed wholly, or in part. See earlier blog post – What happens if I do not make a Will. It’s never too early, but all too often it can be left too late! Don’t let it happen to you. * In everyday speak, “residue” means something that is left over. The same is true of a gift of “residue”. It is a gift – in a will – of the remainder of the estate, once all specific gifts, debts and expenses have been paid. It is whatever is left over. This can be a very sensitive subject and one that many people shy away from – infact, 75% of the adult population in the UK have not made a Will or any other form of Estate Plan, yet 90% have very firm ideas as to what they want to happen to their assets after they have passed away. This covers the majority of the population! When someone dies without having made a Will they are said to die intestate. Their estate (ie all their property, assets, monies etc) will pass strictly in accordance with the Laws of Intestacy (see future blog post for information on what this means). The wishes of the vast majority of people is to keep family wealth within the family and to stop it being able to go to third parties such as divorcing in-laws or creditors (probate, trade, tax or care). Our process is specifically designed to help you identify those wishes and ensure that any planning is appropriate. Making a Will is not painful or life-threatening. It does not require you to list all your possessions. It is never too early, but all too often it can be left too late! 75% of the population don’t have a Will in place but you have to wonder if they truly appreciate what happens if they don’t make a Will. Basically when you die without a Will in place you will die intestate. The flowchart below gives some indication as to how your estate would be distributed under the laws of intestacy. Anyone who has ever watched Heir Hunters will know how easily inheritances can get diverted. Are you willing to take the risk of yours ending up going to the Crown? Don’t be caught out – for a free, no-obligation chat get in touch. Hmm – sounds intriguing. Well I can tell you that would be right. Over the last few months I have been beavering away developing a range of new legal services that I can offer clients. A year ago I would never have thought it possible that this would be an area of work I could go into, but it just shows how networking can be such a positive, and life-changing, experience. A chance meeting with a fellow networker led to an invite to an introductory meeting to hear about changes in the legal profession. At the end of the session I was so inspired as to what the team of barristers at the Legal Services Guild had developed that I was snapping at their heels to sign up for the training. I have to say it was pretty intense, and followed up with two 2-hour exams!! However, the whole process has been so well designed, and the Guild are so supportive in every respect, that the journey has been very exciting. Now fully qualified as an accredited Barrister Intermediary I am ready to start meeting with clients and other professional partners. That’s the great thing about this – I am able to work collaboratively with Accountants, Financial Advisers, Solicitors etc, to enhance the service that we all provide for our clients. Let’s face it, there’s no point having all your investments nicely sorted if they are not properly protected. Between us we can ensure that our clients have a holistic Estate Plan in place (Wills, Trusts and Lasting Powers of Attorney) to ensure that their assets end up going to the intended beneficiaries without delay. We also ensure that any legal costs are minimized and that everything is in place to ensure that loved ones’ affairs are properly looked after if they should lose capacity. If you’d like to have an informal chat with me about this, please don’t hesitate to get in touch. This post is for all my lovely co-workers from the Colleagues on Tap day at Perspective Business Centre in Consett today. During our Spot chat after lunch we discussed how to stay focused and not get distracted by emails, social media etc. We all had our own little techniques, some more effective than others, and it was great to be able to pick up some tips along the way. During the day I was catching up with some online social media training that I’d purchased and was listening to the videos through the headset – not very sociable but it kept me on task. There’s a tip right there – spend the day with a headset on!! As is often the case in our house, TV viewing tonight was rugby. Normally I wouldn’t mind but tonight I thought I would continue with my video training. When you’re on a roll ….! Well, it just so happens that the first one I clicked onto was ‘Managing Your Time on Social Media’. If only I’d listened to that one this morning! So – just to prove we do all know what we’re talking about I’m putting the gist of it below in bullet points. Social media can be a massive time drain – really?!? Imagine it costs you £1 per minute to use social media – that should keep you focused! So there you go folks – we weren’t so far off the mark were we. And you never know, there may be one or two tips above that we hadn’t considered that could help us even more. Look forward to hearing whether you try any of them out and whether they help. Now – it’s Friday night. Back to the wine! !